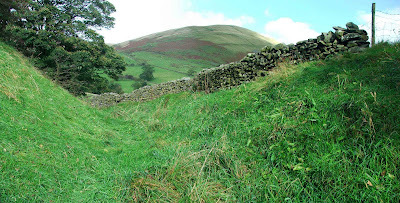 Another site re-visited recently, was the motte and bailey castle at Sedbergh. A small, very well preserved and defined fortification with a complete motte and bailey, this earthwork is a pleasure to visit. Although the trees are still in leaf, it's easy enough to make out the various parts of this fortification. The bailey, a raised earthen platform some 8 metres above the surrounding fields, is just visible behind the trees in the photo above. The motte is superbly preserved. It still stands to around 30 feet high, and is very steep sided and difficult to climb. To the East side of the motte, a more recent field wall is built on top of the bank on the outside of the ditch. It only serves to accentuate the steepness of the sides of the ditch, especially here. 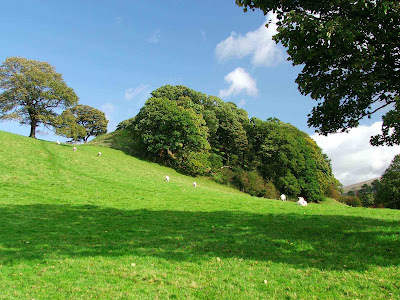 The motte is surrounded by a ditch on all sides, except on its South side, where there is a natural scarp dropping away to the fields some way below. 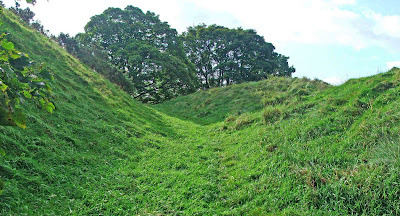 The ditch surrounding the motte is about 10 to 15 feet wide, and around 6 to 8 feet deep. The section of ditch between the motte and the bailey is somewhat deeper, and the sides are much steeper. 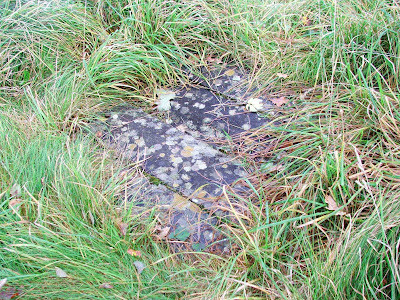 The footings of the observation post mounted on the bailey are still visible. The bailey is basically a huge raised platform, measuring around 40 feet by 80 feet, and is triangular in shape.The castle is easily accessible via a well marked footpath from the middle of the village. It's fairly easy walking, although not suitable for prams and wheelchairs. Delighted I've found all this - especially love mottes. Although of all your castles, seeing Kenmure, a formerly favourite haunt, was the biggest treat. If you're ever down in darkest Galloway (South Machars), Castle Wigg is another in the same mould, and practically impossible to find. Look forward to your next post.